Billy, who was born in Sunderland, was possibly the greatest ukulele player of his generation. Taking an early interest in music he studied the piano at school and became the singer in a jazz band. To give him something to do during the instrumental numbers the band-leader gave him a ukulele with the instruction "Pretend you're playing this". As they say the rest is history. During WWII he toured with ENSA. Sadly, he never made records but did over a 1000 radio broadcasts. He was even sited in one of the Goon Shows when Dennis Main said "Tonight, I have included in my repertoire, Schubert's violin sonata, with guest soloist Billy 'Uke' Scott". You go on with Your Show. Had them eating out of your hand. If you didn't you blame the band and go on with your show. At the age of forty, having appeared at all the major theatres in Britain and having worked alongside most of the Big Names in Showbiz, Billy left the stage to work in television, and was responsible for giving several stars their 'big break' talented newcomers such as Jimmy Tarbuck, Mike Yarwood and Tom O'Connor. Billy retired to Southport but still played occasional shows. A few years back he did a show in Manchester and performers show biz parodies of famous songs. They were all updated and brilliant. Happily Mike Craig recorded them just for the Rats. 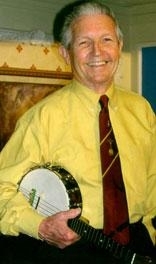 Billy joined the Water Rats in November 1952 having been proposed by George Bolton and seconded by Bob Pearson. He was the 518th member of the Order. He is survived by his devoted wife, Anne, and their four children.